Social robots are being developed to support care given to older adults (OA), people with dementia (PWD) and OA with mild cognitive impairment (MCI) by facilitating their independence and well-being. The successful deployment of robots should be guided by knowledge of factors which affect acceptability. This paper critically reviews empirical studies which have explored how acceptability issues impact OA, PWD and OA with MCI. The aim is to identify the factors governing acceptability, to ascertain what is likely to improve acceptability and make recommendations for future research. A search of the literature published between 2005 and 2015 revealed a relatively small body of relevant work has been conducted focusing on the acceptability of robots by PWD or OA with MCI (n \(=\) 21), and on acceptability for OA (n \(=\) 23). The findings are presented using constructs from the Almere robot acceptance model. 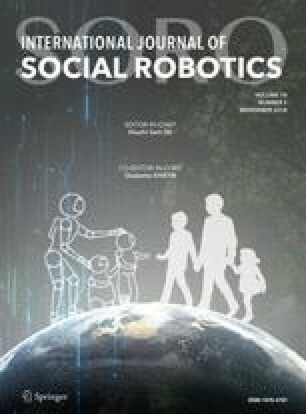 They reveal acceptance of robots is affected by multiple interacting factors, pertaining to the individual, significant others and the wider society. Acceptability can be improved through robots using humanlike communication, being personalised in response to individual users’ needs and including issues of trust and control of the robot which relates to degrees of robot adaptivity. However, most studies are of short duration, have small sample sizes and some do not involve actual robot usage or are conducted in laboratories rather than in real world contexts. Larger randomised controlled studies, conducted in the context where robots will be deployed, are needed to investigate how acceptance factors are affected when humans use robots for longer periods of time and become habituated to them. The research leading to these results has received funding from the European Union Horizons 2020—the Framework Programme for Research and Innovation (2014–2020) under Grant Agreement 643808 Project MARIO ‘Managing active and healthy aging with use of caring service robots”.